With a huge selection of accessories for card making, anyone who loves creating handmade cards can create endless original designs. Basic supplies like cardstock, patterned paper, cutting tools, adhesives, and scissors will create card templates, but it's your choice of accessories that really make each card unique. Color, design, and placement all play a part in the creation of a special card. If you're not yet confident in your abilities to design cards well, there are plenty of card making books and websites that can help. Newbies to card making may find it helpful (especially to their budgets) to buy tools and supplies as needed. While craft stores have a multitude of items for card making, you may already have some of the needed supplies at home, particularly if you scrapbook as well. Once you have your basic card making supplies at hand, these decorative accessories will really put the icing on the cake. You may find it helpful to sketch designs beforehand so that you know where to place everything, or you can always consult books for ideas. While you can always draw and cut shapes such as circles, squares, hearts, and flowers, paper punches make this task easier, quicker, and possibly neater. Punches come in a wide range of shapes, making it simple to have a stack of shapes ready to go in a matter of minutes. You'll also find corner punches that add decorative touches to card corners, a task that would be more difficult if done by hand. Look for coupons for shops like Joann Fabrics and Michael's - you can often find punches discounted by 30 to 40 percent during sales. These small embellishments go a long way toward making a card memorable. They come in a huge selection of colors, shapes, and designs. Plain, solid-colored brads are perfect against backgrounds that are busy and vibrantly patterned, while theme brads, such as sports or baby items, can add a lot of personality to a simpler card. Brads are normally sold by the package and are relatively inexpensive. Like brads, eyelets are small embellishments that add neat touches to your cards. They also come in many different colors, and can be used to attach items to paper. Some jewel-like accessories are self-adhesive, while others will need to be glued. However, all of them add dimension and sparkle to cards. These tiny gems look like rhinestones, pearls, crystals, and more. When you want to add an image or words to a card, rubber stamps make it quick and easy to do so. You may find the same phrases in different font styles, so you can choose the design you like best. Stamps can be used with pigment or ink dyes in many different colors, allowing you to get a multitude of looks from a small selection of stamps. As with paper punches, buy rubber stamps when they're on sale at your local craft stores whenever possible. One of the biggest advantages acrylic stamps have over rubber stamps is that their clear design allows you to see exactly where the stamp will go. These lightweight stamps are placed on clear blocks when stamping. 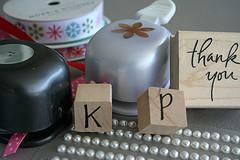 Acrylic stamps are flat and are usually easier to store than bulky rubber stamps. Silk and paper flowers are sold as singles or in packs. Many of them have a plain center, allowing card makers to insert gemstones, brads, or eyelets into the middle. These pretty accessories would be perfect for cards for Mother's Day, birthdays or anniversaries. All of these accessories may seem like a lot -- and there are many more available -- but you don't have to purchase them all, or all at once. Plus, when you buy small items like brads, there are often so many in a package that it may last you for quite a while. Card making can be a very satisfying hobby, as card makers have more choice and selection in tools and accessories than ever before.